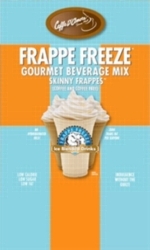 Caffe D'Amore Skinny Frappe Freeze Coffee-Free Creamy Base Mixes are the perfect start for your reduced-calorie creations! Create your own custom Ice Blended Coffees & Smoothies using these low calorie, low fat, low sugar, creamy base mixes + your imagination! For rich coffee frappes, just add espresso, skim milk, and ice. For delicious smoothies, just add juice and/or fruit! Skinny has never been so sweet! Enjoy great chocolate and vanilla flavors in an assorted case of five 3 lb. bulk bags.